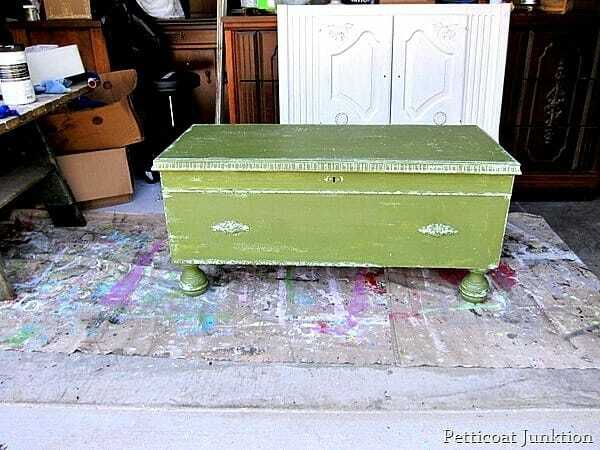 This cedar chest makeover didn’t go according to plan. Par for the course for me. I bought the chest in Feb. 2013 and this is it’s fourth makeover since then. We use the cedar chest as a coffee table/toy box. You have to love those ball feet and the detailed trim. When I purchased the chest from my friend Kendal it had been painted at least twice. 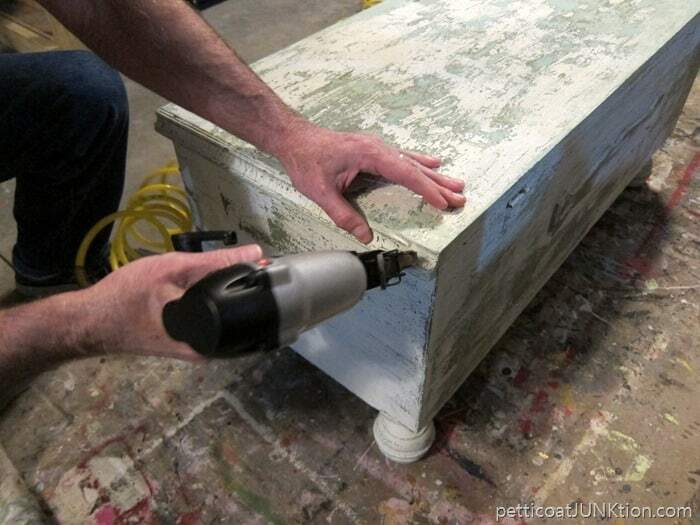 The paint was uneven and there were a few places where the paint was a little thick or bumpy on the top. 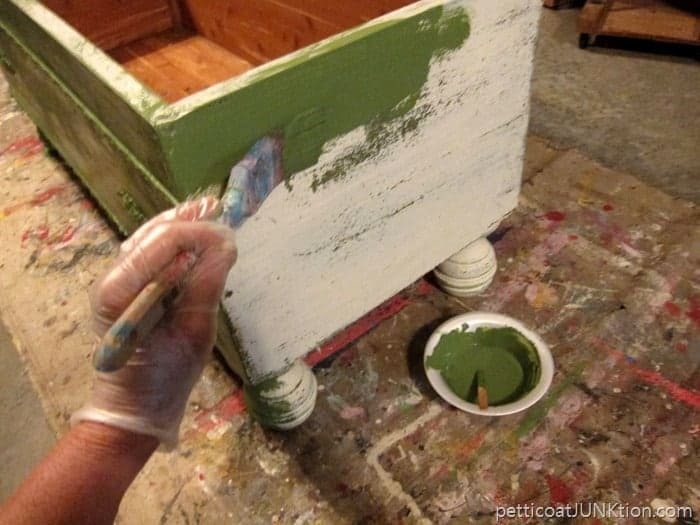 The color was a pale green and I painted it a different green when I brought it home…..then repainted it a year later to the boxwood green color. The next year I painted the chest once again. I painted all the tables in the den white to lighten everything up. The color that time was MMSMP Linen. Time for me to paint it again. This photo was taken on February 7th before I went to Arkansas for two weeks, returned home, and was sick for two weeks. I know you guys are tired of hearing about me being sick so I’m done. How do you like my work clothes? I’m so stylish. I usually don’t work in the carport but it was raining and the piece needed sanding, especially the top. Remember I mentioned how it was kind of uneven and gunky on the top. And of course it has at least 7 layers of paint on it. I used my favorite 9 inch sander. I have 4 sanders and this is my fav. After I sanded it smooth the JTS did a few repairs before I started painting. 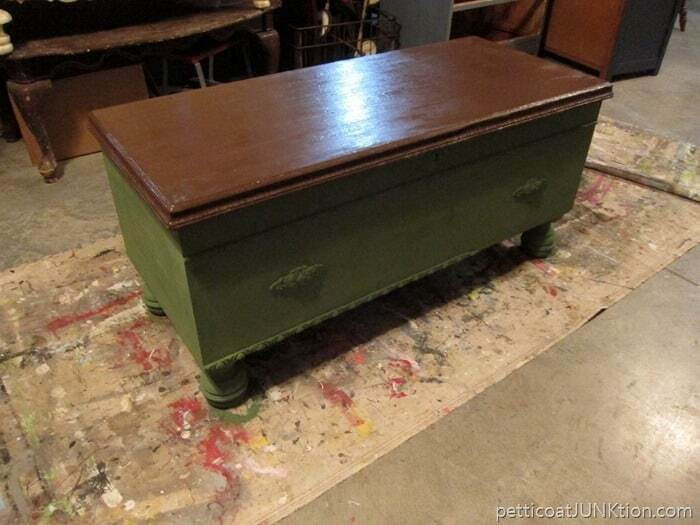 I mixed this pretty green color for the base of the cedar chest. The I painted the top brown. Not looking too good. Looking even worse. I don’t know if it was the combination of all the paints on the lid or what but you can see the splotchy mess. Since I didn’t like the brown anyway I started over. Moving on to plan number two. 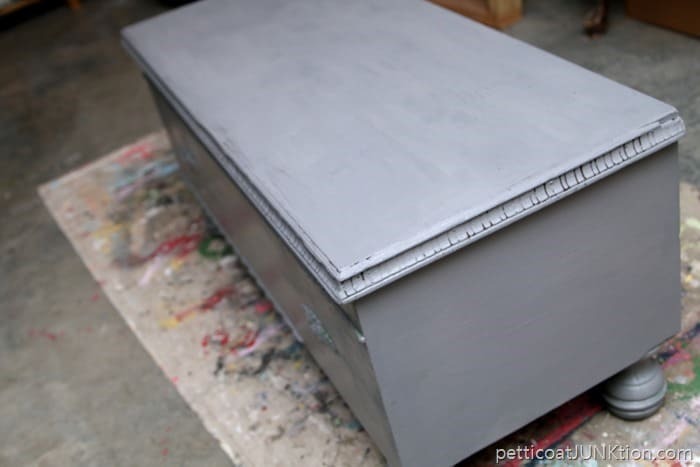 I painted the chest with Glidden Gripper Primer tinted gray to see if it would cover the mess on the top. 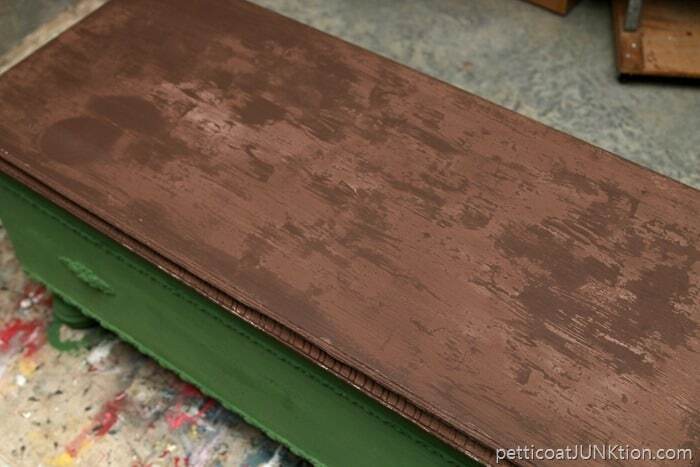 It did……after two coats. This is where the story ends for today. The photos of the finished project didn’t turn out so well so I have to take more and you guys have to wait. Sorry. update: I finally finished the chest….. 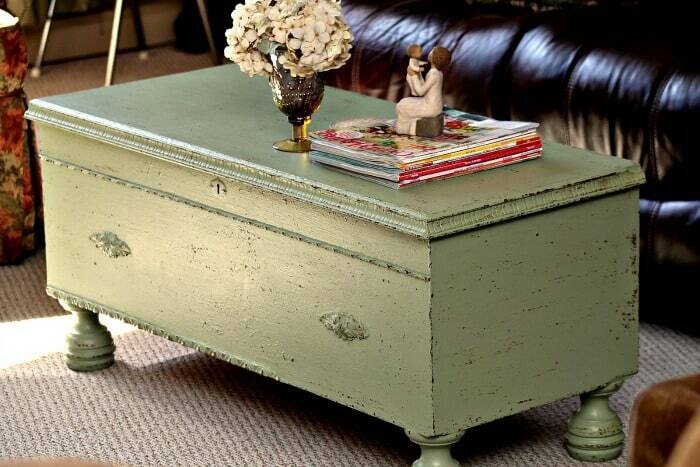 I painted it pale green and used the FolkArt Layering Block to add brown flecks of paint to the highlighted details. sometimes you just gotta keep changing things. I’ll look at something when I’m doing a mosaic. I keep looking and looking. I finally decide I have to pop the piece off. Then I’m glad I did. Well you and that chest have certainly been through a lot together! 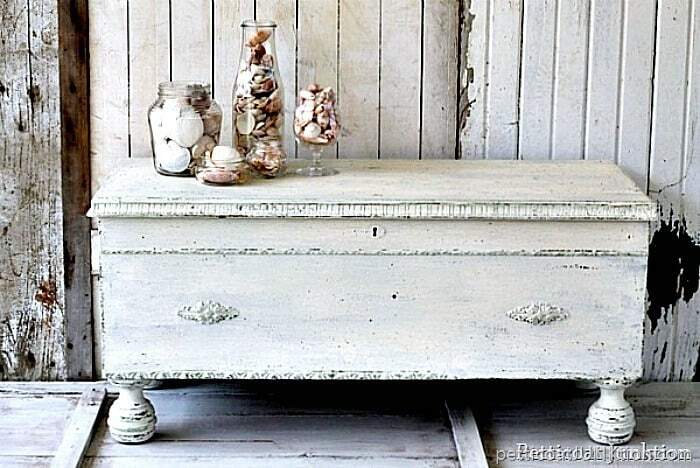 I kind of liked it with the white paint, but at the same time, I think it needs something a bit darker. I am curious to see what you finally did with it. Glad you’re feeling better. Feeling rotten is the worst for me because I can’t do, do, do anything! Thanks Louis for the tip about the app. I will give it a try. Holding my breath to see the chest reveal! 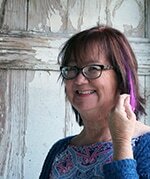 Kathy – I just wanted to thank you first of all for your interesting blog-I’ve learned sooooo much from your ideas- products – and techniques!! Thank you. 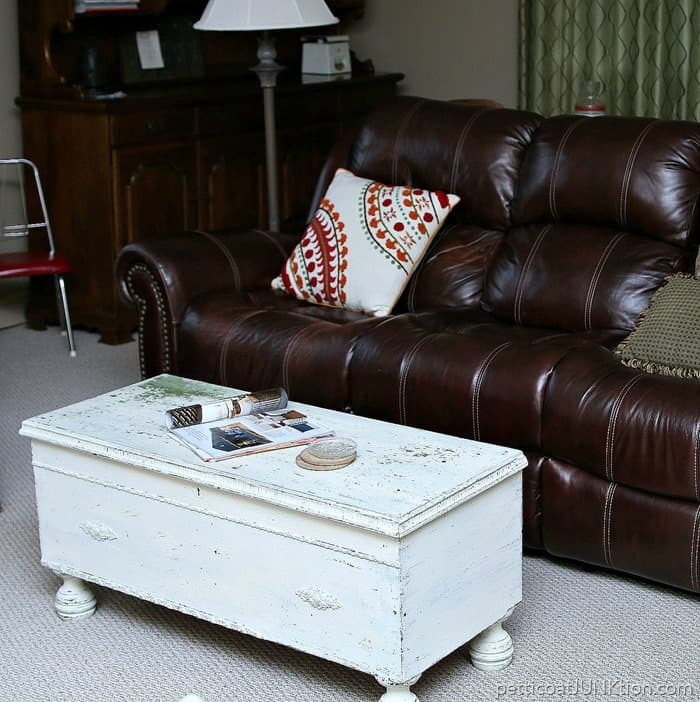 You had said in a blog recently that Real wood furniture was getting harder to find. 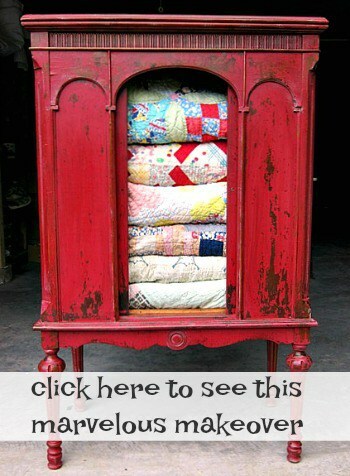 Try a free app called OfferUp. It’s like an online yard sale. Didn’t know about this OfferUp site, thanks for sharing that! 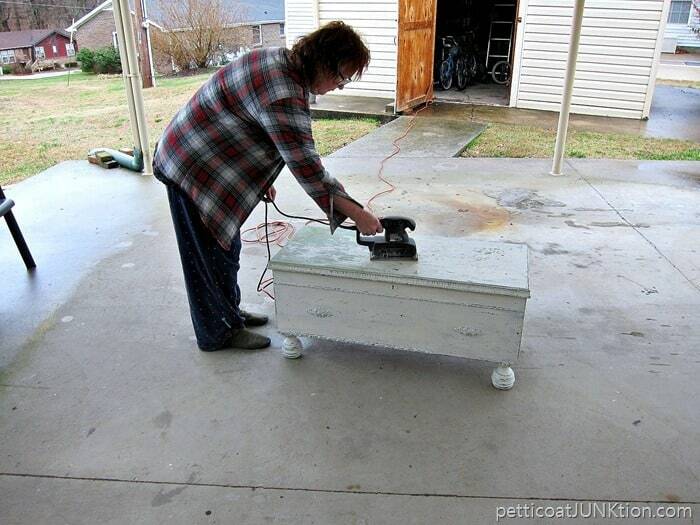 Maybe I can find some old pieces to try out some of Kathy’s ideas. I live in a very rural area and this is really nice to know about.